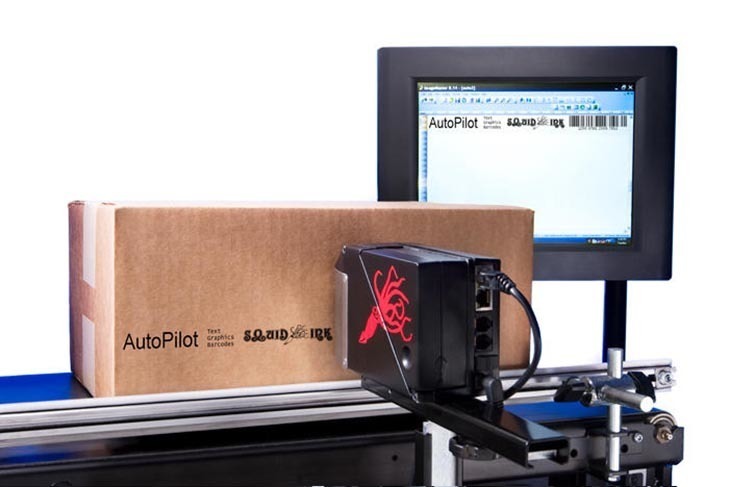 Squid Ink introduces the AutoPilot™ printing system, a feature-rich hi-resolution printing system available at an entry level price. Squid Ink’s AutoPilot printing system offers several advantages over competitive HP® or Lexmark® – based printing systems. With the AutoPilot, users can expect 30% larger print, the ability to upgrade to a 2nd printhead, message programming via touchscreen user panel, the ability to print bar codes with standard systems, the ability to print on a variety of porous and non-porous surfaces, and much more. The AutoPilot is designed to meet the harsh demands of your application. CE, TUV, and FCC certified, the AutoPilot features a durable touchscreen, industrial strength resin printer construction, and allows the AutoPilot to operate in the most extreme factory environments. In addition, Squid Ink’s PZ-1000 ink for porous substrates offers low maintenance performance, eliminating the need for auto-priming functions and offering better ink utilization than competitive systems. You can be confident that AutoPilot’s rugged design will withstand the most abusive industrial environments while providing superior quality print.